Stickybeaks is a small glass-fronted café with unfussy decor (bordering on all-white minimalism), a good helping of cute, vintage touches, and a welcoming, homely atmosphere. Ten or so tables are arranged around the glass counter, which holds not only an array of delicious homemade cakes but separates the customers from a big gleaming silver range, sink and prep area that make up the kitchen. I loved the handwritten labels on each dessert and the pots bubbling away in the background, which created a lovely feeling of being in someone's home. I snapped up the window table, set in a little alcove looking out onto Sussex Street, and let the gorgeous savoury aromas from the kitchen guide my choice from the lunch menu. The menu, which by the way is short, simple and displayed on a wooden clipboard, proved to be a very pleasing collection of quick breakfasts, warming winter lunches, and seasonal salads.  This is the place to go for comfort food without feeling bad about the calories. 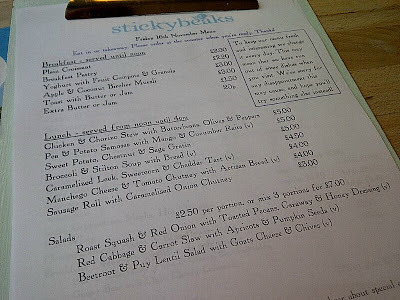 Plus Stickybeaks is licensed, with a small and perfectly formed wine list from which to indulge in a little lunchtime wine. Big thumbs up. 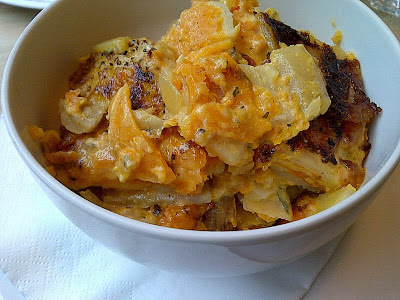 Along with my glass tumbler of Chilean Sauvignon Blanc, I had the sweet potato, chestnut and sage gratin; layers of tender root vegetables piled high in a bowl and held together beautifully by the creamy, almost stringy, sauce and sweetness of the sage. The huge portion was nearly too much for me and great value for £5.00. I would have liked to find a few more pieces of chestnut in the gratin, but then I am a self-confessed chestnut fiend, and I also craved a little crunch from the browned top layer. The selection of salads on offer was too tempting to pass up. 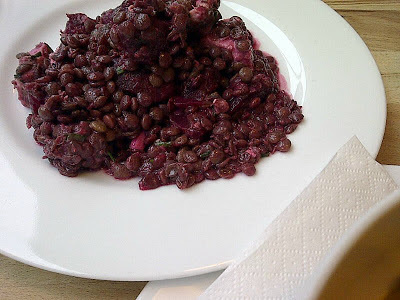 The menu features three options for £2.50 each or £7.00 for three, one of which was a combination of ingredients that I absolutely love: puy lentils, beetroot and goats cheese. The generous plate of salad was well-seasoned and full of balanced flavours and textures, but the added chives had little impact. It was a good, filling addition to my lunch and cut through the buttery richness of the gratin, which helped me polish off the whole lot! My verdict? Take a big appetite, a book or one of your favourite people to Stickybeaks and plan to over indulge. In a good way. Stickybeaks is open 7 days a week with special evening events, demonstrations and supper clubs every month.